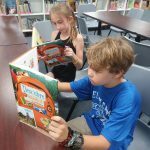 Students have been enjoying bilingual literature to improve vocabulary, listening skills and cultural appreciation. 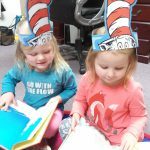 They celebrated Dr. Seuss’ birthday with favorite stories and rhymes. 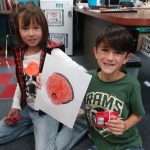 Younger kids created a Spanish version of Brown Bear, Brown Bear, What Do You See? 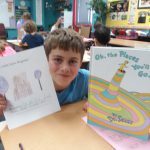 Students explored Spanish fairy tales and customs. Literature has provided an opportunity to teach grammar and sentence structure. 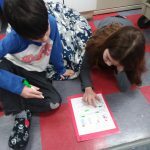 Middle and older kids have practiced verb conjugations and improved their writing skills. 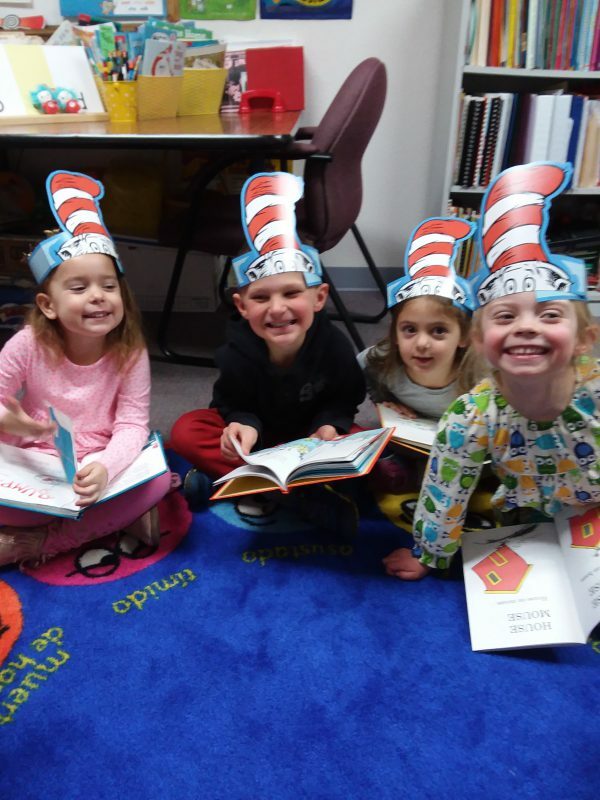 The middle kids presented a choral reading to the preschoolers about animals hibernating in winter. 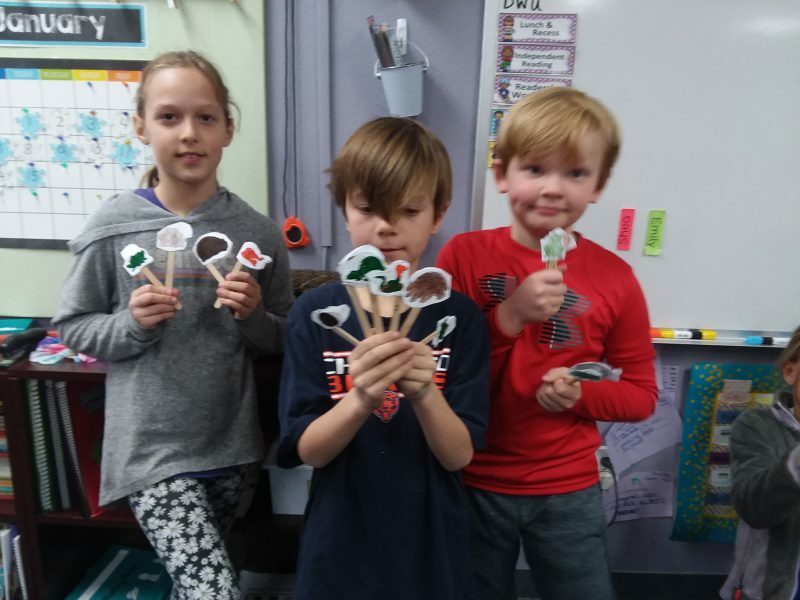 They made stick puppets and recited lines in Spanish about different animals that sleep during winter. This cold, gray winter weather makes us all want to duerme, duerme, duerme. Olé, the mercado was a success. 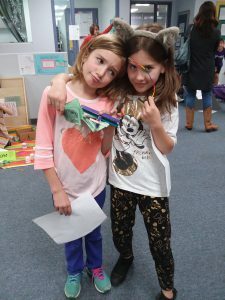 Students made piñatas, poppers, cupcakes, origami, airplanes, catapults, jewelry, cookies, metalwork and more. Thanks to all the parents for their support in making the student projects. It was a loud and happy commons where students came to spend their pesos. Shouts of ‘compralo’ were heard as eager vendedores sold their wares! 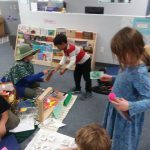 Students had the opportunity to practice speaking Spanish, and to bargain for fun crafts and food. There were smiles all around as everyone visited the market. 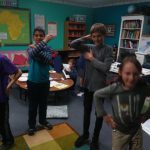 The 5th graders presented a skit in Spanish to prepare for the experience. Enjoy the photos of this annual fall highlight. 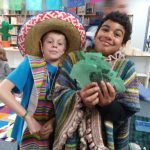 Students are looking forward to our Latin American market. 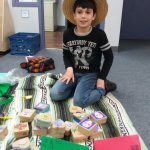 Older kids are making crafts or food items to sell at the mercado on Tuesday, November 13th. All students will be given ‘pesos’ to shop and enjoy the experience. Students are learning phrases and dialogue to speak Spanish with the vendedores. 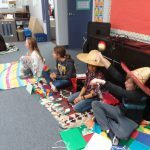 Fifth graders will present a skit in Spanish about a family visiting the mercado. 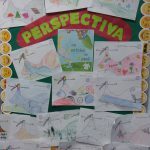 Middle kids made illustrations for the story “Los vestidos de Mamá” about perspectiva. Our school wide conceptual lens this year is perspective. 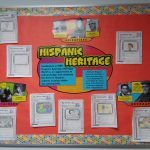 All students learned about the contributions of Latinos during Hispanic Heritage month. Spanish classes are going swimmingly as we integrate the school wide topic study of oceans. 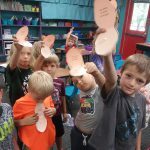 Students are engaged as they learn vocabulary in Spanish and English. 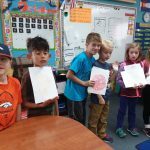 Younger kids created ‘ostras con perlas’ or oysters with pearls, while middle kids explored their Spanish-English dictionaries. 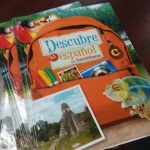 Older kids are excited to begin a new curriculum called Descubre el español. 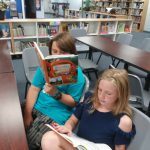 They have new text books and technology to supplement their learning. 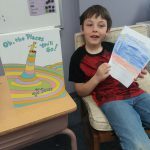 Thanks to fundraising efforts we were able to update our curriculum. Looking forward to a great year and fun mercado experience in November. 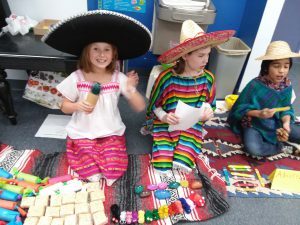 Students celebrated cinco de mayo with a fiesta. 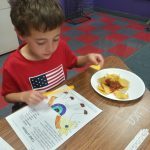 They had chips and salsa, musica, dancing and crafts. 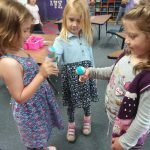 The younger kids made maracas and all students danced the Mexican hat dance. 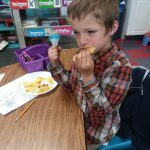 They enjoyed the music, food and activities, while learning about the history of this celebration. Cinco de mayo is NOT Mexico’s independence day, which is actually celebrated on September 16th. 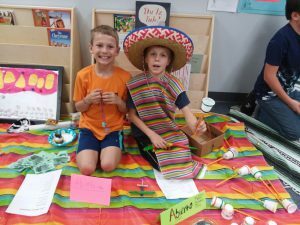 Students were surprised to learn that the United States has a bigger celebration for cinco de mayo than Mexico does. 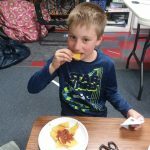 Enjoy the fun pictures of this Spanish experience. 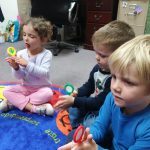 The preschool and younger kids enjoyed listening to Huevos verdes con hamón in Spanish. 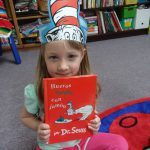 They compared the English and Spanish versions of this popular Dr. Seuss book identifying rhyming words and common phrases. The middle kids explored the book ¡Oh, cuán lejos llegarás! 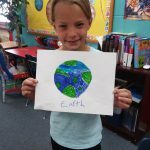 while writing about places they would like to go. The older kids have been working on conjugating regular -ar verbs in the present tense. 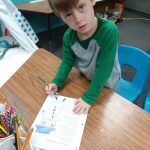 They are also writing about things they like to do using me gusta with infinitive verbs. They designed revistas or magazine covers in Spanish. Welcome to winter! 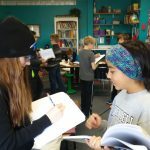 Students are building their vocabulary and conversational skills in Spanish. 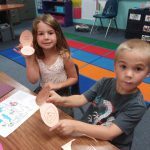 Drawing and describing snowmen helps students practice body parts and clothing words. 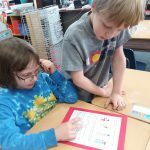 They discuss favorite seasons and activities with a partner. They develop their listening and reading skills matching text to pictures. 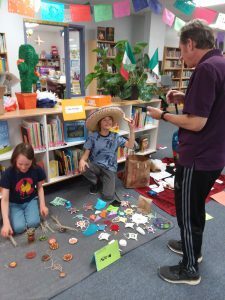 The Latin American market was a fabulous success this year. 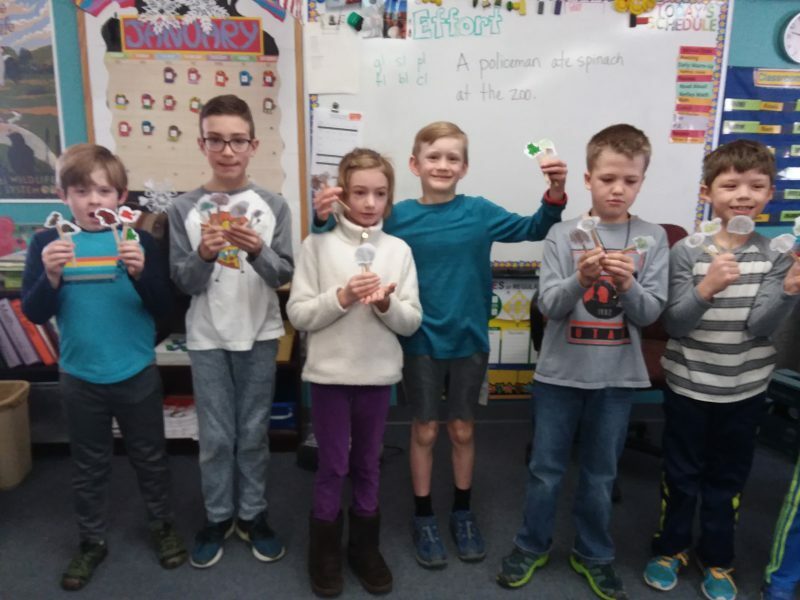 The older kids made creative crafts and food to sell to the rest of the school. 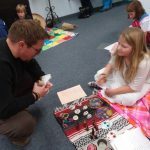 Students enjoyed the culture and experience while practicing their Spanish language skills. The atmosphere was lively, punctuated with phrases like “Compralo” and “Cuánto cuesta”. The vendedores wore bright attire and eagerly promoted their crafts and food. It was definitely a sensory adventure. 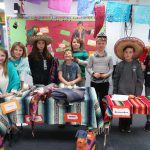 The 5th graders did a brilliant job presenting their Spanish skit about a family visiting a Mexican market. I was very impressed by their poise and pronunciations. Great job to all. Students are excited about the upcoming Latin America market. 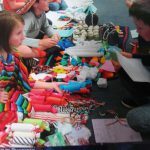 Older kids are preparing crafts to sell and everyone is practicing their Spanish dialogue. This is a great opportunity to experience the culture and customs. 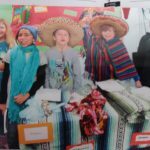 All students are encouraged to dress in Latin American attire for the market on Thursday, November 16th. 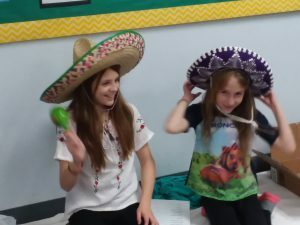 The fifth graders will present a Spanish skit on Wednesday, November 15th for the school. 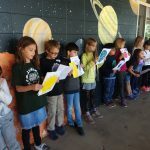 The middle kids presented a choral reading about the planets called ‘Vecinos en el espacio’ or Neighbors in space. 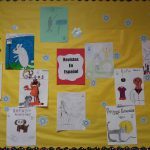 They did a great job with their pronunciations and illustrations. The PS and YK classes enjoyed watching them. 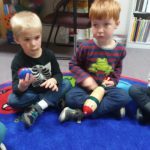 The preschoolers played instruments to pan pipe music and loved singing Spanish songs.